Un updated version of a family favorite! 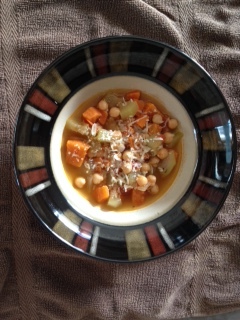 This stew is a great lunch time soup or a vegetarian dinner accompanied by salad and whole grain bread. 1. Saute onions, sweet potato, and carrots in olive oil until sweet potato and carrots soften a bit. 2. Add long squash, salt, pepper, cumin, thyme and continue to saute for another 5 to 7 minutes. 3. Add vegetable broth, chickpeas, and tomato to mixture and simmer for 15 minutes. 4. Taste and add additional spices if desired. 5. Let rest on stovetop for 10 minutes before serving in bowls with parmesan sprinkled on top (optional). 6. Serve with whole grain bread and side salad.